More information: Value-for-money 3CD box set including KAIPA’s albums “Notes From The Past”, “Keyholder” and “In The Wake Of Evolution”. Excellent Prog from Sweden - an absolute bargain! Featuring members of The Flower Kings and Transatlantic. KAIPA is a Swedish progressive rock band that is already active since the mid 70s. 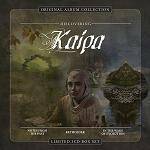 KAIPA have released numerous classic albums and have proven to be one of the most persistent and most reliable bands in the entire scene. This 3CD set offers the possibility of discovering this excellent band. If you have scratched the surface just once, you will no longer hesitate to dive deep into the musical cosmos of KAIPA. Enjoy the trip through utter progressive brilliance.